Memo from Number 10 (Clive Whitmore) to the Foreign Office (Brian Fall) 2 July 1981 begins: Dr. Garret Fitzgerald, the new Taoiseach, telephoned the Prime Minister at 1800 yesterday evening. The line over which the conversation took place was particularly bad, and I am afraid that there are periods when Dr. Fitzgerald was inaudible, but I think that have pieced together the essentials of what we had to say. A United States of Ireland? Memo from RL Wade-Gery to Sir Robert Armstrong about meetings of the Anglo-Irish Joint Studies Groups 12 March 1981: There were two occasions on which the Irish had to be firmly slapped down, but these were clearly try-ons, and their failure was accepted with good grade and without protest. The first occurred early. The Irish explained frankly that their eventual objective was a Federal Ireland, achieved on the basis of majority consent both in the Republic and in the North. This was when Charlie Haughey was Taoiseach but the federal idea at the time only existed in a Fine Gael document. As another section of the papers notes, Fianna Fail at the time had no actual policy paper setting out their views on Northern Ireland. Was it widely known at the time that Charlie had told his senior staff that the ultimate goal was federation? A political row festered in Iraq on Friday, as a top Sunni leader denied he penned a commentary criticising the Shiite-led government, the latest in a crisis that has stoked sectarian tensions. Since the departure of US troops less than two weeks ago, Iraq has plummeted into a political standoff, with authorities having charged Sunni Vice President Tareq al-Hashemi with running a death squad and premier Nuri al-Maliki calling for his Sunni deputy Saleh al-Mutlak to be sacked. Mutlak and Hashemi's Sunni-backed Iraqiya party has boycotted parliament and cabinet, and on Wednesday, the New York Times ran a piece by three Iraqiya leaders -- Finance Minister Rafa al-Essawi, parliament speaker Osama al-Nujaifi and Iraqiya leader Iyad Allawi -- sharply critical of Maliki's administration. Nujaifi, however, has since said his name was added to the piece without his knowledge. "The article published in the New York Times... has been written without the knowledge of speaker Nujaifi," said a statement issued by his office late on Thursday. Despite all this, the public-private wage gap in Europe wasn't always so large, and really began to widen after 1999. That has at least something to do with the introduction of the euro, which allowed employees to compare their pay with peers in other countries. One result was that government workers in particular were able to negotiate better contracts. It's an interesting point, but the big wave of Irish public sector pay increases didn't spring from comparisons with other European countries. It sprang from alleged comparisons within Ireland. And these comparisons, post-1999, themselves reflected the damaging effect of the convergence of interest rates due to the Euro: house prices were increasing rapidly, leaving public sector workers feeling priced out, and the anecdotal accounts of big money being made in real estate and banking -- in an easily dazzled media -- were growing. Add to that the relative power of public sector unions in Ireland, and you have a story. The epigraph could come from comparing the resulting pay scales with those in other Eurozone countries. King George VI actually rejoiced after the fall of France, writing in his diary 1940: "Personally, I feel happier that we have no allies to be polite to and pamper." That is the true voice of Britons, and one that David Cameron has articulated superbly. Er, was 1940 a good time to be optimistic? Minister of Public Works and Minister of State for Municipal Affairs Dr. Fadhil Safar stressd here on Monday the need to take the necessary requirements and regulations to prohibit smoking and the hubbly bubbly, known as "shisha," in public places, restaurants and cafes. Interior Ministry announced on Monday that it has asked the Ministry of Communications to suspend all anonymous accounts on the social networking site (Twitter). The ministry said in a press statement that such measure comes in order to preserve the rights of citizens and residents of people who were used to slander them and their families under fake names, saying that such is a crime punishable by law. It confirmed that all public have the freedom of expression guaranteed to them by the Constitution as long as those practices are going according to the law, especially with regard to using the (Twitter) site. A year ago, the conventional Beltway wisdom had it that Iraq was a failed state. Today, the same wisdom holds that it is less chaotic but still fragile, dependent entirely on a U.S. presence to survive. But judging by recent comments from Nouri al-Maliki, even this view may be out of date. Inevitably we'll hear this is all the fault of the Bush Administration and the original sin of invasion. Some facts are inconvenient. In the last four years, Iraq put together a workable if imperfect political process. Major violence ceased and a 600,000-man military was formed. Oil revenues are flowing. What changed? The U.S. decided to leave. Incidentally, the former Wall Street Journal editorial was arguing against Barack Obama's proposal as a candidate for a US withdrawal from Iraq in 2009 and in favour of an agreement-based withdrawal with a few extra years after 2008 to assure stability: the exact approach that President Obama implemented. Iraq may be the country most Americans would prefer to forget, even if its remarkable quiescence during this season of Arab revolt is a testament to how much the U.S. achieved there. Yet U.S. interests in consolidating an alliance with Iraq have never been greater. There wasn't much "quiescence" even in the months prior to that sentence, and there certainly isn't now. Mr. Gingrich was “a disaster” as speaker and most likely would be as a nominee, Mr. King said, given his “compulsion to exaggerate,” erratically changing ideas, intellectual arrogance and the grandiosity of his self-comparisons to the likes of Winston Churchill and others. Above, George W. Bush using careful White House advance team staging to compare himself to Churchill and FDR, during an event in Halifax, Nova Scotia, in 2004. Goldman Sachs. The Cayman Islands. A complex structured investment vehicle. The Irish Stock Exchange. What could possibly go wrong? Lawyers who structure products to comply with Islamic law warn that, whatever the merits to the scholarly debate, investors may be deterred by the doubts. “Goldman can list this programme on the Irish Stock Exchange, but that does not mean they will get the buyers,” said one lawyer who specialises in the field. “They may well find there is not much demand because of the widespread doubts over the issue in the market.” ... He added that Goldman would make use of the commodities and was not just flipping them to the original seller to create the illusion of a sale. And he said that the listing on the Irish Stock Exchange was for regulatory and tax purposes – scholars and potential investors did not anticipate a secondary market. David Cameron this morning: "Britain is out of it and will remain out of it." He was referring to the Euro but it serves rather unfortunately as a description of Britain's current position in the overall restructuring of the European Union that is now happening. Incidentally, his remarks about the new deal surrendering more sovereignty and/or being outside the framework of the EU are not doing the Irish government any favours in terms of its own legal rationale for how to ratify the agreement. In the two main Republican contenders, we have one man, Romney, who seems to have walked straight out of the 1950s, and another, Gingrich, who seems to have walked straight out of the 1960s. He has every negative character trait that conservatives associate with ’60s excess: narcissism, self-righteousness, self-indulgence and intemperance. He just has those traits in Republican form. What has the last 30 years of Republican dominated politics in the US been about if not narcissism, self-righteousness, self-indulgence, and intemperance? That's the simplest explanation for why free tax cuts, free wars are so central to the project. Iveta Radicova, the Slovak Prime Minister, entering the Brussels summit this evening with a fancy Apple. The Portuguese PM was also clutching one on the way in. The others stick with the large piles of paper. It makes them look busier. 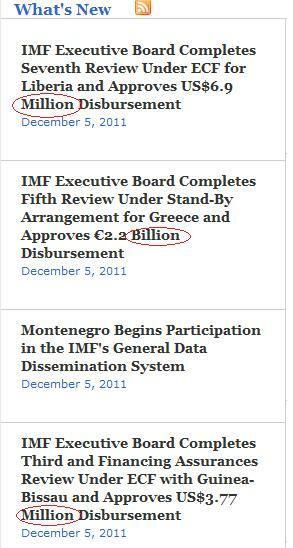 IMF website 5 December 2011. Loan disbursements to African countries on the order of 1/1000 of what Greece is getting. Of course the Eurozone is a big crisis, not least if you're in the middle of it. But is this the right attention ranking relative to where the really poor people actually are? WAM Abu Dhabi, Dec 04th, 2011 (WAM) -- The Fatwa and Legislation Section of the Department of Judiciary- Abu Dhabi, announced that the first day of Muharram falls on Sunday November 27. A statement issued by the Fatwa and Legislation Department, said that after a meeting of the three committees in charge of moon sighting, on Friday evening, November 25, the crescent was not sighted by any of the committees within the state. Therefore, Saturday (Nov. 26) was the last day of Dhul Hijjah, and Sunday is the first of Muharram. Hence, the 10th of Muharram corresponds with Tuesday (Dec. 6). This matters for dating the Ashura festival. That means that today, Sunday 4 December, is 8 Muharram. In Saudi Arabia, today is 9 Muharram. * Offer not applicable during June 2012. French Foreign Minister Alain Juppe said that Greece, which relies on Iranian oil, had objected to a ban on buying it. But he said work toward an embargo would continue. 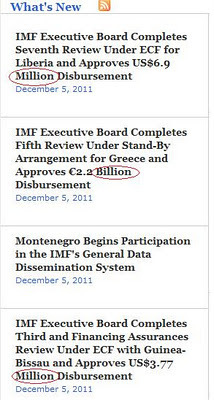 "Greece has put forward a number of reservations," Juppe said. "We have to take that into account. We have to see with our partners that the cuts can be compensated by the increase of production in other countries. It is very possible." This is Iran we're talking about, which was suppressing pro-democracy movements with violence before it was cool, and now is backstopping the Assad regime in Syria as it kills children for fun. And Greece is complaining about oil sourcing?